WHEN TO BRING THE BOTTLE UP ? The bottle has to be brought up from the cellar one or several hours in advance. 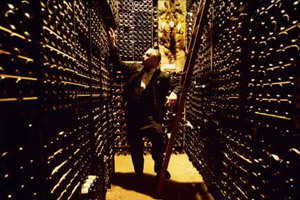 A young wine should be transported and uncorked in vertical position. A bottle of venerable age (risk of deposit) will be set down with precaution in a pouring basket and served without being straightened. In case the wine has to be bought, it should be done the day before at the latest. Leave it to settle standing up in the dark in the coolest place. Never keep it too long in the refrigerator.